In today’s rapidly-changing world, students will need to be nimble and adaptable. They need the knowledge, skills and confidence required to thrive and prosper in the workforce of today and of tomorrow. Ontario’s universities are responding to that need. They are creating meaningful partnerships with communities, businesses and government to offer internships and other work integrated learning experiences. We want our students to have all of the tools they need to prepare them, not only for their first job, but with the adaptable skills for a successful career. Helping our graduates identify the human skills they have developed and explain what they have learned to prospective employers is an important part of their short term and long term success. Educating for the Future 2018 recently brought together professionals in the postsecondary sector to share ideas on how universities and colleges can ensure Ontario’s students are getting the knowledge and skills they need to prepare for the future. With more than 90 sessions in this year’s program, universities and colleges, along with ?partners in the postsecondary sector came together to share the latest trends, tools, research and best practices on the development and assessment of learning outcomes and hands-on learning. 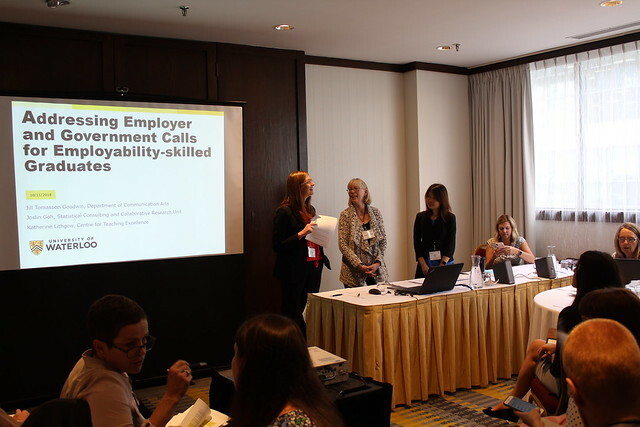 The breakout sessions took a deeper look at how professionals in the sector can help students prepare for the transition from postsecondary education to successful careers through academic quality and work-related education. The expansion of hands-on learning opportunities provides students with the knowledge and adaptable skills that employers need ? skills such as critical thinking, collaboration, communication and problem-solving. Whether in STEM, humanities, social science or professional programs, universities are working to ensure Ontario’s students are equipped and supported as they develop new skills and choose pathways that hold value in a changing economy.